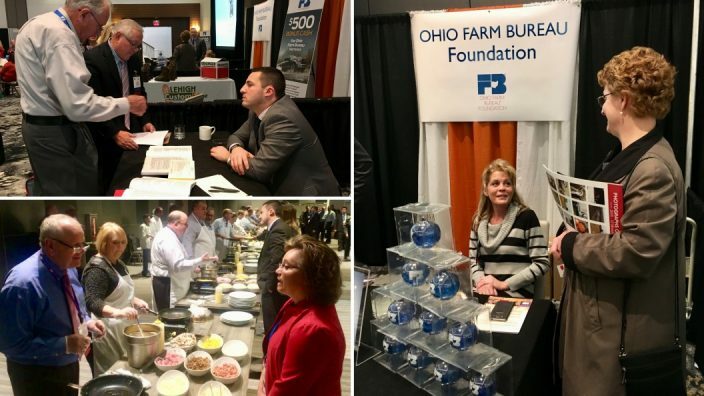 Delegates from Ohio’s 86 county Farm Bureaus, special guests and honorees are meeting in Columbus Dec. 6-8 for Ohio Farm Bureau’s 99th annual meeting. Follow Ohio Farm Bureau on Twitter and Facebook for updates. How can farmers and ranchers maintain their buying power with the continued trend of input supplier and provider consolidations? Four finalists will be announced Thursday, Dec. 7 during the Harvest Banquet. Update: Finalists are Casey Ellington, Stark County; Jacob Hoelscher, Darke County; Seth Middleton, Shelby County; and Annie Specht, Tuscarawas County. They will compete in the state finals Feb. 2 as part of the Young Agricultural Professionals Winter Leadership Experience. Conference registration is open through Dec. 15. The Ohio Farm Bureau Foundation recognized several scholarship recipients who were able to attend the Kickoff Breakfast. OFBF President Frank Burkett, III gave his annual address. Watch his speech. OFBF Executive Vice President Adam Sharp addressed delegates and guests at the Delegate Lunch. Watch his speech. Trustee elections take place this afternoon. County Farm Bureaus, membership volunteers and Distinguished Service and Agricultural Educator awards will be presented at the evening’s Harvest Banquet. Congratulations to Distinguished Service Award winners Ken Davis, Highland County and Fred Finney, Wayne County and Agricultural Educator Award winner Shirley Boyd, Franklin County. Delegates set the policy agenda for the coming year. Frank Burkett was re-elected OFBF president, Bill Patterson was re-elected first vice president and Cy Prettyman was re-elected treasurer. Jenny Cox was elected southeast regional trusteee. Al DiVencenzo was re-elected District 3 trustee. Roger Baker was re-elected District 8 trustee. Katherine Harrison was re-elected District 11 trustee. Bill Waddle was re-elected District 14 trustee. Al Miller was re-elected District 17 trustee. Lane Osswald was re-elected District 18 trustee.